An Ancient Solar System...: Will Philae live? Above: The twisted, black, ice of comet 67P. ...then completely failed to anchor itself with it's gas thruster, harpoons, or ice screws, and bounced back off into space. 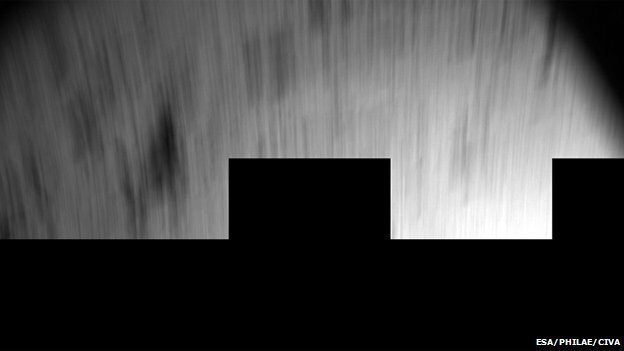 Above: An image from Philae of a landscape blurred by speed. Not what you want to get from a spacecraft that has just 'landed'. The washing machine sized robot slowly bounced up and around the comet, under the weak gravity there. It hit a ridge, hit the ground, bounced off again, and finally came down in the shadow of steep cliff. Not a good positon for a solar powered robot. In the days that followed the science team made a desperate scramble to collect as much data as possible with the robot's tools, before its battery died, possibly forever. They succeeded, and as Philae's batteries failed they bade farewell to the child of so many hopes and dreams. Above: The 'sound' made by the comets magnetic field, sped up 100,000 times so we can hear it. Jean Pierre Biebring, part of the Rosetta team, said "... really the question is whether or not some electronics might suffer from the cold." 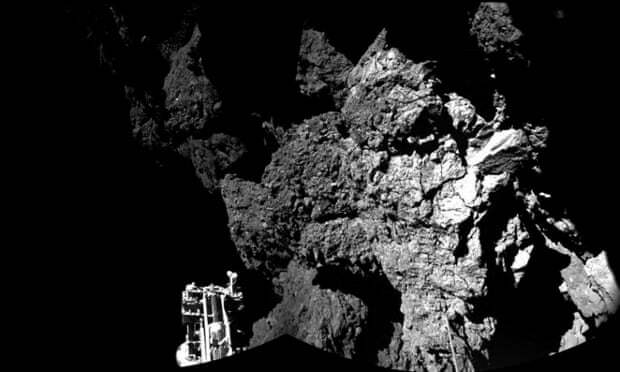 But the robot is designed to handle cold temperatures - the camera can operate at temperatures of -150 degrees Celsius for example, and Philae has already endured the harsh environment of deep space. Will the little droid that went to stand on a comet make a comeback? We should know around March next year, as the sun rises higher in Philae's sky, and grows brighter with the comets fall towards it. The European Venus Express probe is going down in flames, over the skies of Venus. Now the first craft to reach the interstellar void, Voyager 2 returns even more surprising data about the gas, dust, and magnetic fields out there. Tiny worlds, asteroids are usually thought of as barren, but it turns out that the soil on some of them can be used to grow crops.